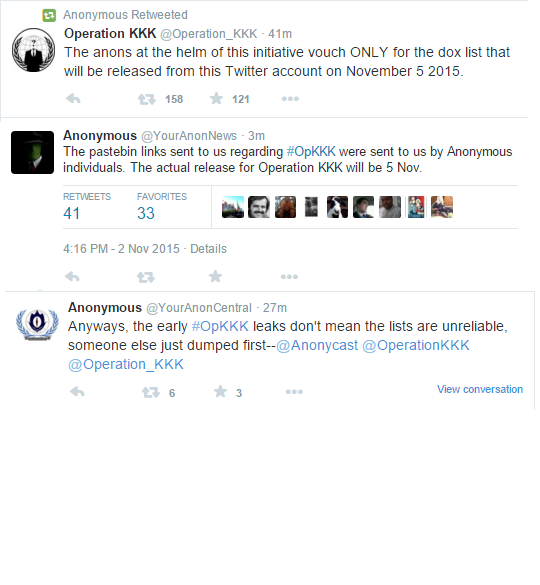 Alleged KKK Members in Government Outed: #OpKKK or Premature Celebration? The hacktivist collective Anonymous had recently made promises to release personal information on 1000 members of the Ku Klux Klan currently serving in elected positions throughout the United States, so when the internet was treated to a storm of activity revolving around the leaked emails and phone numbers of 23 individuals ranging from Congresspeople to city mayors today, Anonymous were immediately pinned with responsibility. That might have been premature. The exposed numbers, emails and names can be found on separate PasteBin.com pages and were not posted by Anonymous in specific, but a Twitter user called Amped Attacks. Affiliation between the two has been denied by Amped Attacks, although they do claim to be an independent anti-hate group hacker. There is both a history of animosity between the two groups and precedent for Anonymous’s intended actions going back to the protests in Ferguson, Missouri in the wake of the police shooting of Michael Brown and the subsequent acquittal of Officer Darren Wilson thereafter. As the KKK threatened to use armed force against protesters in Ferguson, Anonymous hacked the Twitter account of a local KKK chapter and exposed its members. The group also alleged connections between the Ferguson PD and the KKK. Four of the five mayors have released statements about the leaked list, denying involvement with the Ku Klux Klan, some like Mayor Rogero citing her multiethnic background and former work with Cesar Chavez as evidence that the KKK might want little to do with her. Official Anonymous Twitter accounts have released statements that those at the tip of the spear in what is being called #OpKKK did not release either list, that media should fact-check, but that their statements do not necessarily invalidate the posts. Next PostPresident Urges ‘Ban the Box’ at Federal Level, Will Utica’s Own Movement Get a Boost?